Don’t just dream about a pool, buy one.At some time in everyone’s life they dream of having their own swimming pool – but one visit or call to the local pool company is often the first and last step any of us ever make when we learn that something that looks very similar to a gold fish pond will set you back at least £30,000. That was until now, because Eauzone, has just launched the fantastic range of Waterair in-ground pools that cost from just £5,000. These pools, which are easy to construct and come complete with filtration enabling everyone to enjoy their own pool and one that really is a decent size.Eauzone offers nine different pool models in sizes that range from 5 x 3 metres to 20 x 10 metres at very competitive prices. There is a range of options available to personalise your pool, e.g. steps, heating, spotlights etc. 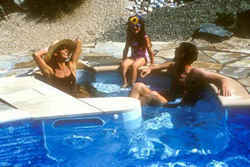 It is better to find out the cost of a hidden/invisible water pools before finalizing. All the elements of the pool arrive on pallets and are easily constructed using the simple instructions. The customer then lays the special flooring and puts in the hard wearing liner.The filtration and optional heating systems are then installed and the outside of the pool backfilled with earth. The liner is then fitted, using a unique system to secure it and the coping stones are then laid, giving the final touch. It’s then just a case of adding water and the pool is ready for use. 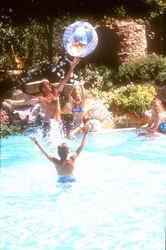 A Waterair pool takes approximately five to ten days to install including the digging of the initial site. The good news as well is that each pool is guaranteed for 10 years and is very easy to maintain. Just think a pool of your own for less than the price of a new car – who would ever have thought it possible? Well now Eauzone Pools has joined hand with our partener site – PoolXperts and has made one dream a reality and its one that everyone can enjoy.